Shaun the Sheep - BN Licensing B.V.
Aardman's Shaun the Sheep is a global daily broadcast show (broadcasted by Ketnet and Zapplin in the Benelux). 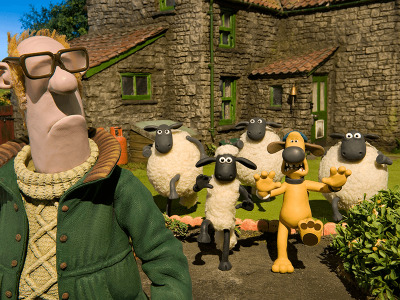 With a large network of broadcasters (including Nickelodeon, Cartoon Network, Disney Channel) the first series of Shaun Sheep appears to be a worldwide mega success. Shaun the Sheep has won international prizes and awards, including: Children's BAFTA Award, International Emmy Children & Young People Award, Audience Choice Award (World Comedy Film Festival), Crystal Award (Annecy International Animated Film Festival), Age 5-10 Audience and Parent's Choice Award (New York International Film Festival), 2nd Prix Jeunesse 7-11 Fiction ... It's hard to believe, but Shaun's best time is yet to come! 2015, in Chinese astrology "the year of the sheep," Shaun has all eyes on him. Aardman Animations is currently working on Shaun film debut, expected to be seen in global cinemas in the spring of 2015. With a movie coming up and fun events and promotions around "the year of the sheep," Shaun the Sheep offers many exciting and interesting possibilities. "Shaun the Sheep's Pompom Parade Campaign for Wool" is currently even nominated for "Best Licensed Marketing Communication Campaign Award". And if that is not enough, Shaun recently proclaimed by the Radio Times' favorite BBC children's TV character of all time! Copyright © 2016 Aardman Animations Ltd. All rights reserved.